Celiac Disease & Other Food Allergies: Celiac symptoms, lactose and gluten intolerance symptoms, gluten-free diet, and more. Send for this new FREE guide and learn the facts about celiac symptoms, lactose and gluten intolerance symptoms and how you can go gluten-free happily, healthfully and confidently! Quite simply, because eating “gluten-free” is making them feel better. And not just a little better. A lot better. For many, they are feeling better, healthier, and happier than they have in years. For these men and women, going gluten-free means gaining freedom—freedom from the pain, bloating, distress and damage of celiac disease and gluten intolerance symptoms. And, gluten-free is not a sacrifice. Today you can find delicious, varied “gluten-free” products in almost every supermarket aisle. Cookbooks offer easy-to-make “gluten-free” recipes. Restaurants are responding to demand with robust “gluten-free” menus. Should you go gluten-free? Could you or a loved one have celiac or a gluten-intolerance? With this new FREE guide, you find out. More than three million Americans have celiac symptoms and 18 million more have gluten intolerance symptoms. Unfortunately, the majority of cases go undiagnosed. Too many think it is normal to have a “bad stomach” or other aches and pains. The fact is, it isn’t normal. You don’t have to pay the price. You can stop the symptoms and start enjoying meals without fear and your life without the pain. Download your copy of this essential wellness-restoring guide now. It’s yours absolutely free! What are celiac symptoms? What are gluten intolerance symptoms? How do they differ? And what is gluten? Gluten is a protein found in wheat, rye, and barley. For someone with celiac disease, their body reacts abnormally to gluten. Typically celiac symptoms include gastrointestinal problems, such as bloating gas, or diarrhea. If left untreated, celiac disease can cause intestinal damage, as well as osteoporosis, anemia, and certain types of cancer. Individuals with gluten intolerance, or more properly, non-celiac gluten sensitivity, suffer similar symptoms, but without the autoimmune reaction or intestinal damage. Did You Know? Celiac disease was first described in the second century, but the cause wasn’t identified until the 20th century. In 1950 a Dutch pediatrician linked the ingestion of wheat proteins as the cause of celiac symptoms. It is only in our lifetime that adults and children can be definitively tested for celiac and gluten-sensitivity. In the FREE guide, you’ll find why anyone with celiac disease, by definition, is gluten sensitive, but why not all gluten-sensitive people have celiac disease. The later-life event may trigger adult-onset celiac disease. Celiac symptoms and gluten intolerance symptoms can be missed. What many don’t realize is that different organs can be affected by different types of gluten sensitivity. For example more than 1 in 5 people with celiac will have a distinct skin rash (See page 10 of the Guide). Another gluten-caused condition can affect your balance and certain neurological disorders can be associated with celiac disease. The guide will brief you on the full spectrum of “gluten-related disorders” and gluten intolerance symptoms…the one genetic test that can rule out celiac…and two complications women should be especially aware of (Page 13). Download your FREE copy now! The Solution for Celiac Symptoms and Gluten-Intolerance Symptoms! Keeping a strict gluten-free diet—avoiding all foods that contain wheat, rye, or barley—is essential for those with celiac disease or non-celiac gluten sensitivity. The key is to focus on what you can eat, not what you cannot. This instructive and empowering FREE guide will tell you everything you know to go beat the wheat and enjoy the wealth of wellness that comes with gluten-free living. You’ll be introduced to gloriously gluten-free foods and warned about products where gluten may lurk. Step up to the plate—the gluten-free plate! 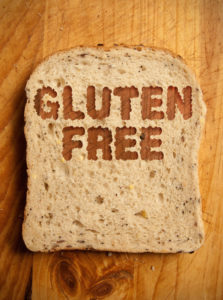 People on a gluten-free diet can eat a well-balanced menu with a wide variety of foods. Unprocessed meat, fish, rice, fruits, and vegetables do not contain gluten. Plus, you no longer have to give up breads, pasta, or your favorite cookies and desserts. The FREE guide will introduce you to more than two dozen alternative flours that let you bake without compromising taste and texture. Everything from millet to merlot flour (yes, there are wine flours! )…from buckwheat (which is not a wheat) to the wide array of rice flours that are a staple of successful gluten-free baking. The truth is, going gluten-free is a lot like magic. It’s easy when you know how it’s done. The guide will help speed your transition from the clutches of wheat to the comfort of satisfying gluten-free meals. Color-code pots, pans, and utensils to tell which are dedicated to gluten-free use. Keep a permanent marker in the kitchen and write “GF” on all safe foods and condiments. In this practical guide you’ll get tips for stocking your gluten-free pantry. You’ll enjoy ideas for gluten-free snacks the whole family will love. And you’ll learn the “secrets” to finding delicious new gluten-free foods—yours free for the tasting! And because even small amounts of gluten (as little as one-eighth of a teaspoon) can set you back if you have celiac symptoms, you’ll appreciate the FREE guide’s clear recommendations for avoiding cross-contamination in your kitchen. Prepared by University Health News, this guide will show you the keys to gluten-free kitchen success. Discover how easy it can be to eliminate the foods that fight you with foods that will delight you. Download your FREE copy now! You can banish gluten-intolerance symptoms…you can end celiac symptoms…and start living healthfully and confidently gluten-free! This FREE guide answers your questions with solid strategies and practical solutions. You will be prepared to conquer common situations, dine out smartly and safely, and travel with assurance. Celiac disease cannot be outgrown, but it can be outsmarted. For people suffering celiac symptoms and those with gluten intolerance symptoms, a gluten-free diet is a life-changing change for the better. Gluten-free living is not about saying “No.” It’s really about saying “Yes!” It’s saying “yes” to feeling better… ”yes” to having greater energy… ”yes” to foods your body doesn’t have to fight… ”yes” to meals that give you both satisfaction and welcome peace of mind. Declare your gluten-freedom! Get your FREE copy of this fact-packed guide now. Looking forward to seeing this report. Yesterday I filled in this info (there was no password asked at that time) in order to get my free copy. When later I pressed the “download PFD”, I was asked to put in my email + a password which I then created, and was told that my email/password was ‘incorrect’. You now have my name and email but I don’t have the free booklet! Is this a scam? I am extremely disappointed with this! Celiac is not an allergy. Sorry you’re having difficulties. In order to open the report, you need to first go to the confirmation email you received when signing up. In the email will be a temporary password and instructions on how to change it. After doing that, you can log in and you should be able to access the free guide immediately. Can I get a ‘hard’ (printed) copy of this report? If so, please let me know how/where it is available. Thank you.